This doesn’t look good. We’re heading towards a towering wall of water that has Capsize written all over it. We paddle hard, digging deep into the swirling river. But we hit the wave square on and the raft is flung skyward. Suddenly, I’m paddling through thin air. And I’m no longer in the raft. Everyone else has managed to grab the safety rope, but I’ve been catapulted into the middle of a Class 5 rapid. I surface, wide-eyed with fear. Thankfully, a support kayak appears and tows me back to the boat, where Tembo, our guide, is there to greet me. 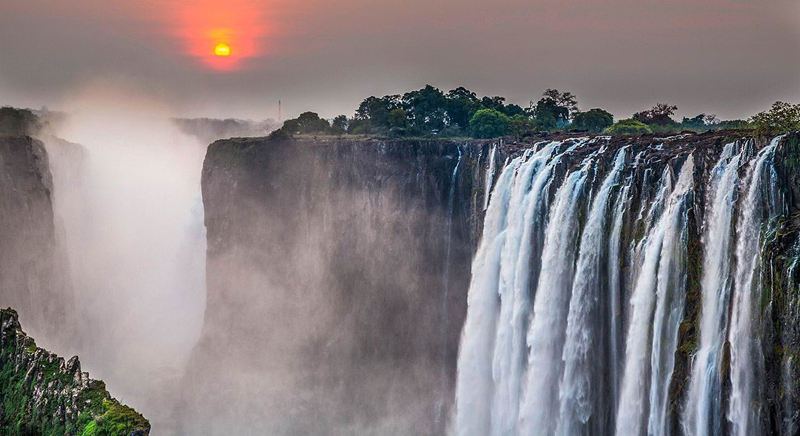 “Next time,” he says, “grab the rope.” After thundering over the 5,604 ft-wide Victoria Falls, the Zambezi River froths and boils its way through a zig-zagging canyon of basalt rock, creating 25 rapids with ominous names, such as The Gnashing Jaws of Death. Tembo has rafted the Zambezi more than 3,000 times, but even he can’t predict what the river will do. Fifteen minutes later, we’re all in – this time at the Class 5 Oblivion, where a mountainous wave flips the boat like a tiddlywink. After three adrenaline-fuelled hours of paddling, we stumble wearily out of the rafts and into a cable car, which whisks us out of the canyon. When you have just spent the morning battling The Gnashing Jaws of Death, there are few more welcome sights than the Royal Livingstone Hotel. Located on the Zambian side of the Zambezi, just a few hundred feet upstream of the falls, it’s a colonial-era haven of antique furnishings and impeccable service. 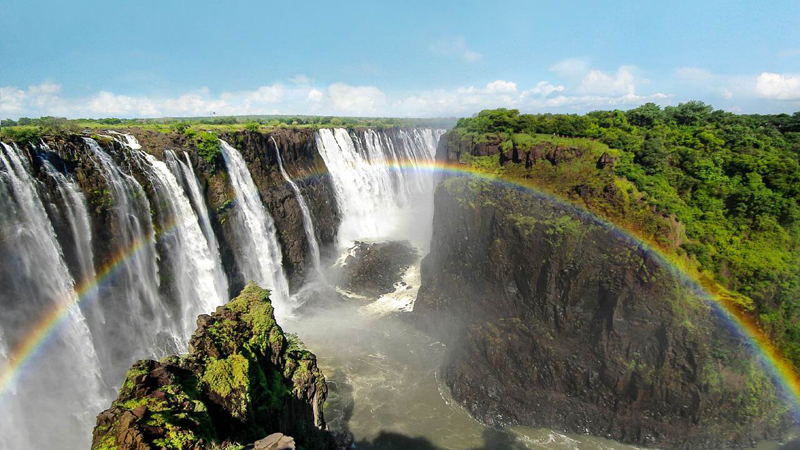 While Victoria Falls is not the highest nor widest waterfall in the world, it is the largest sheet of falling water. In the rainy season, 3,000 tonnes of water per second come crashing down into the 354 ft-deep canyon, creating a swirling mist of vapour that can be seen 31 miles away. The next morning, I stroll down to the falls, passing a series of lookouts before getting buffeted by spray-soaked winds on the disconcertingly narrow Knife Edge Bridge that vaults the river. While being this close to the falls is undeniably impressive, you’re almost too close to fully appreciate its scale and grandeur. Fortunately, there are other ways to marvel at this natural wonder. The next day, I’m speeding down a makeshift grass runway in what looks worryingly like a cross between a hang glider and a hairdryer, with a strapping young German called Heiko wedged between my thighs. This is my first time in a microlight and I’m astonished at how quickly we’re airborne. Thirty seconds later, we’re over the Zambezi; five minutes after that, we’re swooping over Victoria Falls. From here, I can see how the falls have moved upstream over thousands of years, its first site six miles downstream. For my final encounter with the ‘smoke that thunders’, I’m collected from the hotel by speedboat and whisked across the Zambezi. Eustace, my guide, takes my hand and beckons me towards the edge. No railings, no safety nets, just a furious torrent of water plunging into an impenetrable cloud of mist. I pose nervously for a photo before hurriedly retreating. I had no idea it was possible to get this close to the edge. However, Eustace has even more adventurous plans for me. We walk to the other side of the island where, to my horror, he wades into the river, just feet from where it cascades over the falls. We’re headed for a natural Jacuzzi sheltered by rocks. But, thankfully, the river is too high to make it to Devil’s Pool, even closer to the edge. I sink back into the swirling warm water, feeling relieved. The falls are spellbindingly beautiful – but this is quite close enough for me.